The 12-episode run once again sees the Red Rocker traveling the country to interview and often perform with some of the most popular and influential musicians, including season 3 guests Roger Daltrey, Judas Preist singer Rob Halford, Neal Schon of Journey, Bob Weir, Pat Benatar and Neil Giraldo, and more. “It’s been a cool surprise how much we’re all enjoying the interview part of this show because, as artists, what happens on stage or in the music studio is the easy/fun stuff and the interviews often feel like the work,” says Hagar. “It’s like when the camera lights go on and the questions start, that typical wall or guard is down because it’s me on the other end and not a seasoned journalist asking the questions. 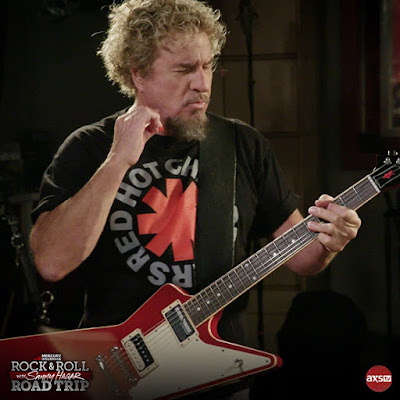 Season 3 of “Rock & Roll Road Trip with Sammy Hagar” will premiere with guest Dave Grohl of the Foo Fighters on AXS TV on Sunday, April 8 at 9 p.m. ET / 6 p.m. PT. Hagar currently has a few scheduled live dates with supergroup The Circle on his 2018 calendar, including casino gigs in Minnesota and California that will begin later this month.